The Google Docs form is an efficient tool for teaching and learning because it is user friendly, free, and works on most computing devices. Forms can be embedded into a variety of online learning platforms or emailed directly to students for easy access. Recently, Google improved the form by adding some multimedia features, providing teachers with more ways to use it for guided, independent learning. Here are a few great ways to use the Google Docs form. Now you can embed live YouTube video right into a form to create a guided video lesson for students. Consider using this type of activity as a homework assignment to provide students with a common starting point for learning in the classroom. Students can acquire background knowledge and bring it with them to class. A variety of types of questions offer many choices for educators designing video lessons. Information collected through a Google Docs form is instantly displayed in a spreadsheet. Teachers can use a free script called Flubaroo to create self-grading multiple-choice or fill-in-blank quizzes to provide students with immediate feedback. Just follow the steps in the user’s guide to install Flubaroo and gain access to a Flubaroo menu in your spreadsheet. This menu streamlines the process of manually adding functions to a spreadsheet. Pictures can be powerful tools for launching writing activities. Try using a Google form as an alternative to a traditional whole group brainstorming activity to provide every student in the class with sufficient think time to contribute an idea. Gauge student understanding and evaluate the effectiveness of a lesson by using a form as an exit ticket. Use theShow Summary of Responses feature to get a quick glimpse of the big-picture, or dig deeper and focus on individual student responses. Use open-ended questions to provide students with the opportunity to communicate about their learning. 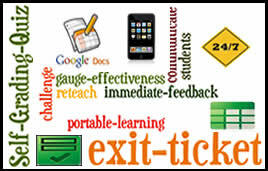 Use the exit ticket to give students a chance to voice their opinions, concerns, and questions. The Google Docs form is an efficient tool that can be used in a variety of ways to support learning and fine tune instruction. If you haven’t explored the tool beyond the basics, I encourage you to revisit it.